Let yourself be immersed in the serene and beautiful landscape of a Chinese valley. As you spin the 3 reels and 3 rows of Treasure horse, you will discover how offering the 18 payline structure actually is. This online video slot by Pragmatic Play can be played on any device, from a starting bet of €0.18. Multipliers, free spins and expanding reel sets are things to look forward to as you spin your way to a possible jackpot of up to 6000x your stake. But, first thing’s first, let’s talk about the symbols themselves. Next to the grid, there’s a table showing you exactly how much you’re in for when you land 3 adjacent symbols of the same kind while playing with a max bet. The prizes range from €25 for 3 Simple Bars, to €2000 for three Coin Symbols. Three consecutive Wilds will pay an amazing €5000. 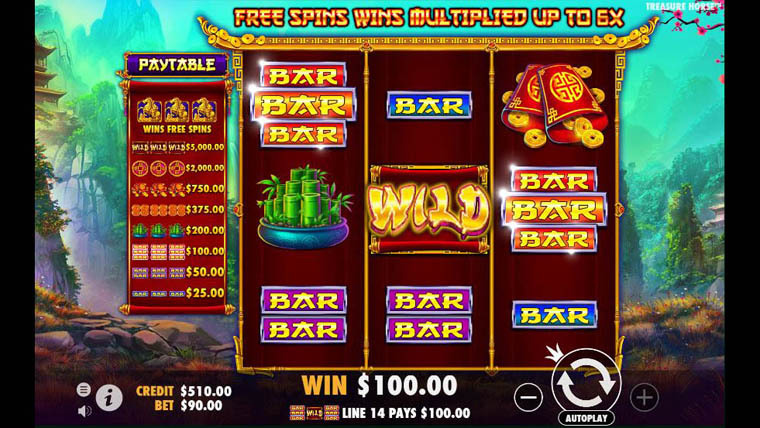 A total of 8 Free Spins are granted to you when you land 3 Treasures Horses. As soon as you trigger this level, a 4th reel will be added to the grid. This extra reel is comprised of multipliers only. All symbols will be stacked during this bonus feature. Why play it: Feel the buzz of a 3 reel online video slot with impeccable design and nifty bonus features. Play Treasure Horse also for the graphic experience it provides you with – serene landscape, oriental designed symbols and flawless sound effects.